A research scientist and genealogist with a background in pure and applied mathematics, statistics, cancer biology and biochemistry, Sophie is an alumna and former college lecturer of the University of Oxford and a 2011-12 Google Scholar. Interested in interdisciplinary collaboration, open science and discussing the experiences of women in science, she is also a keen participant in science communication projects and university outreach. One of her main projects is the Open Science Training Initiative (OSTI), an educational scheme which harnesses open working practices to foster improved reproducibility in scientific research. OSTI was launched during Sophie’s Panton Fellowship with the Open Knowledge Foundation (now Open Knowledge) in 2012-13. In 2015, OSTI was named as the “Best Open Science Initiative” at the Open Knowledge Awards. You can find her on Twitter as @ScientistSoph. It’s Explore Your Archive Week this week (18-26 November 2017) across the UK and Ireland, so I’m encouraging you all to get out to your local archives – or even larger regional or national ones – meet the people who work there, and learn more about the incredible work they’re doing to preserve our collective cultural heritage. And it’s not just about preservation. Archives are a major keystone in enabling us all to explore this information and making it available for us to learn from, whether that’s in hard-copy or digitised forms. What really brings the archives alive is being able to go and access that information, those artefacts and pieces of history, learn from them and build on that knowledge thereafter: this is where you come in. Front entrance to the UK National Archives, Kew, London. So why’s #EYA Week for me? We’re all seeing how rapidly the digital landscape is changing. Our increasingly interconnected world is making it ever easier to get the information we want at the touch of a button. Unfortunately though, that also makes it remarkably easy to sit at home on our computers and only interface with the digitised aspects of whatever we’re trying to learn about, when in fact that’s only one part of the story. Slow and steady: For the interested amateur genealogist, immersing yourself in your local archives at the right point in your research will help you become a more balanced researcher in learning to work with primary sources. It forces you to adopt a slower pace of working, making you think more critically about your methodology and about the material in front of you. Make use of archivists’ knowledge: As I mentioned earlier, online access to digitised content is only one aspect of archival work. Archives are a positive Aladdin’s Cave of wonders, and the staff who work there are usually hugely knowledgable about their collections. Draw on their advice and expertise – it will benefit you and your work. Appreciate your resources: One gripe amongst many new genealogists is the cost of accessing online archives. What they don’t see is the immense amount of work that goes into producing these and maintaining them over time. Getting to see some of this in person helps one comprehend all the processes that contribute to those services, and why they’re worthy of our funding. Interdisciplinary work: If, like me, you’re a scientist, you’ll be familiar with how interdisciplinary working is a major to-do nowadays. The preservation aspects of archival work are excellent examples of how science, arts and the humanities can benefit one another – you’ll hear more about this below in the Collection Care part of Open House. So this week I want to inspire you to get out to your local archive, meet the archivists there (they’re really knowledgeable) and find out more about what’s happening: here’s my experience of seeing behind the scenes at the National Archives earlier this year. 8am and I’m out of the house on a cold September morning and heading to the train station. Destination: the UK’s National Archives at Kew, where it’s Open House day and I’m going to get to see behind the scenes at the workings of this wonderful building. The National Archives (TNA for short) is tucked away amidst residential properties in Kew, south-west London, just a short walk from Kew Gardens station. Walking through rows of houses en route from the station, there’s no mistaking it once the Brutalist masterpiece looms large in front of you. On arrival, I collect my (free and pre-booked) tickets for the various things I’ve signed up to, and then there’s just time for a quick coffee in TNA’s cafe before the day gets underway. Collection Care had organised a series of stations to showcase some of the projects they’re working on. Key challenges for this department are finding out why particular items degrade, and then utilising existing techniques, or developing new ones, to effect the necessary repairs. Predictive assessment forms a key part of their conservation work; if frequently-used items can be identified from user stats, it’s possible to take a “prevention is better than cure” approach and either reinforce items before they’re damaged, or find alternative ways of allowing users to access information from artefacts – including by providing 3D printed replicas where appropriate. 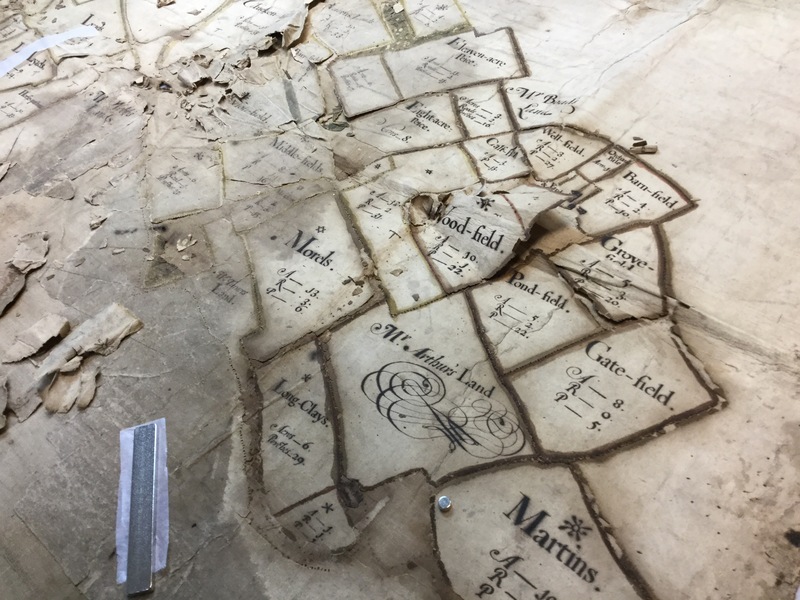 Restoring an 18th century land map is a considerable task, particularly when it’s one that has degraded as much as the one at the centre of Sonja Scholl’s work in Collection Care. Originally drawn during a family land dispute, the map has sustained a lot of damage as it has aged. So: what is the cause of the damage? Investigation into the pigments used indicated oak gall ink, made using oak tree galls mixed with iron (II) sulphate; this has degraded over time and caused damage where it was applied to the paper. The map itself is made from paper on linen, and further problems have resulted from copies of the map being taken. Closer inspection reveals perforations along all the land boundaries: this is from an 18th century copy being taken by using a sharp implement to poke through the map and leave indentations on a second piece of paper which would have been placed underneath. Smoke sponges are used for cleaning dirt from the map’s surface; then some replica oak gall ink is made from scratch and used to identify suitable substances for use in conserving the map. I also had the chance to see some 15th century manuscripts being restored, including some stunning illuminated scripts and a volume detailing Elizabeth I’s response to Parliament on the subject of marriage – the latter, interestingly, in English. When we think about archival preservation, working with parchment, vellum or paper often comes to mind. However, there are plenty of other items which don’t fit into this category. One such is a wooden tally stick collection from the Exchequer, shown to me by Helen Mayor, who cares for the high-demand items in TNA. For items such as the tally sticks, identifying the most suitable kind of storage can be a major task in itself; the irregularly-shaped sticks call for bespoke packaging. When designing containers for items, the staff at TNA have to consider not only the safety of the artefact when it’s in archival storage over time, but how this storage is likely to be affected when items need to be moved or called up. Storage solutions have to take this into account to ensure that items won’t sustain damage at any point in the storage-use-return pipeline. A collection of tally sticks from the Exchequer, in protective foam casing. Additional tally stick storage in layered boxes. 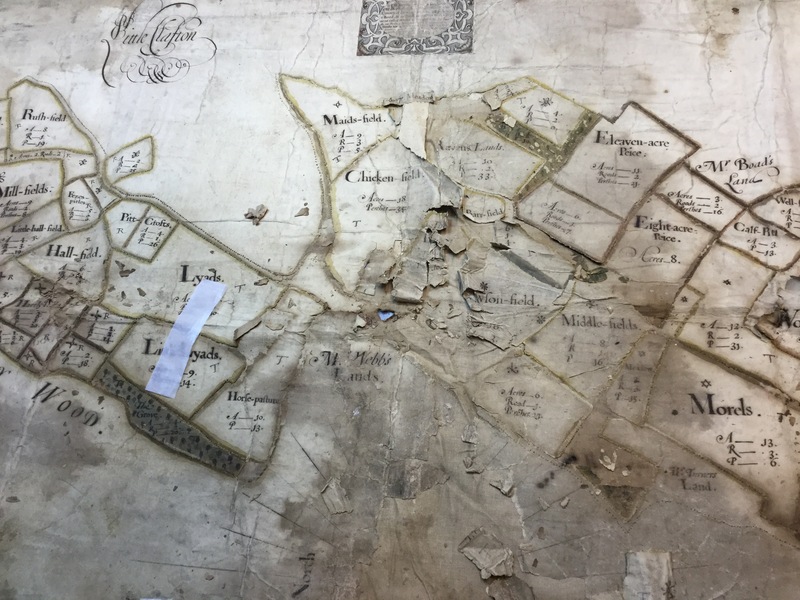 Map restoration and care of the most-used items are only two of the many areas that the Collection Care team are working on: alas, far too much to mention here. Later in the day, Jacqueline Moon provided an excellent lecture on the work of CC, which was great for those who hadn’t manage to bag a place on the CC tours. Other projects include from 3D-printing replica versions of wax seals for general use, thereby protecting the originals from damage. They also make their own wax on-site, approximating ancient wax recipes to gain testing samples which are used to predict how particular seals might degrade over time. Apparently the 3D printer also comes in useful for making bespoke storage cases for some objects. For me, Collection Care was a fabulous fusion of science and art: few places can offer beautiful manuscripts and old artefacts alongside a 3D printer, X-ray crystallography machines and the like. Some restoration work even involves using a single-hair paintbrush to restore cracks in gouache paintings by the war artist Terence Cuneo, a painstaking labour! And the team working on digital conservation is a six-person outfit with responsibility for thousands of documents. The scale of operations at TNA is breathtaking when you see it in person. Next came the repository tour. TNA has around 180km of record storage on-site: obviously we weren’t going to be walking around it all, but the hour-long tour we were given provided a fascinating insight into how the building operates. Due to security concerns, photographs aren’t permitted during this part of the day, so you’ll just have to rely on my words for this until you go on the tour yourself! First we were taken up to one of the many rooms which deal with the stack requests. Over ten million records have been called up at TNA since the late 1990s. That’s an impressive amount; although the majority are stored on-site at Kew, around 6% of TNA’s collection is held in specially-adapted salt mines up in Cheshire (typically these are rarely-used records, or those which have already been digitised). Given the sheer scale of the collection, it’s impressive that most requests for on-site material are fulfilled within 90 minutes, and even items from the Cheshire material can be retrieved within days: testament to both the structuring and management of the retrieval process and the individuals who make it all happen. We were then led through into the repository rooms. One of the first things you notice is that it can get a bit chilly at times. That’s all because of the strict temperature controls throughout the repositories, which are maintained at 16-18°C and around 50% humidity, which is optimal for the documents – if you’re eagle-eyed, you see little temperature and humidity gauges stationed all over the place during your tour. Rolling racking – huge shelving units that can be moved along using either a cranking handle or a motorised system – increase the storage space by around 30-40%, which comes in handy when you’re storing documents on the scale of TNA. What surprised me was the sheer size of some of the items. The largest we encountered on our tour was an enormous box around 10-11 feet long, containing a huge map of Prince Edward Island in Canada. Apparently this item is so large it doesn’t even fit in the lifts easily, so moving it around presents something of a challenge. If you’re thinking of coming to TNA to do some research at some point, then it’s well worth making the repository tour a feature of your Open House visit. It will give you a renewed appreciation for what’s going on behind the scenes to make your research possible. You can tell from this blogpost that I had a fantastic day at TNA and would highly recommend the Open House day. Open House is an annual event and is completely free, although paid behind-the-scenes tours are available at other dates throughout the year (these won’t necessarily include the events I’ve discussed though), which I think often sell out, so watch out for those. If you’re new to TNA and attend your first Open House, then I’d also recommend joining in with the quizzes they hand out on the day, asking you to spot different things around the building and grounds (which include a tranquil garden too). These trails are a fantastic way to get your bearings in the building and gain a quick overview of the range of facilities. The on-site bookshop is also very well stocked, including a good selection of Alan Godfrey OS maps, “My Ancestor” titles and all manner of books on genealogy, family history and general history. My next visit? Hopefully soon, to view some items from J77 – an ancestor’s divorce court file from 1889. Looking forward to it already! Think before you bring. Coats, bags, pens and food are prohibited in most sections of the building and have to be left in the ground-floor lockers. So travel light when you visit TNA and avoid bringing too many valuables. It’s worth checking the “visit us” section of TNA’s website first in case you’re unsure of what’s allowed. Wear layers. Understandably for a major archive, temperature and humidity have to be rigorously controlled within the site, so the air con might have you shivering sometimes…best to dress with this in mind and bring a jumper or cardigan with you. Be quick with online booking for Open House, or arrive early on the day. Some Open House tickets get released online (sign up to the TNA newsletter from their homepage and you’ll get good notice of booking) but they go really quickly – I thought I was being prompt this year but most of the repository tours had already booked up over a month ahead of the event. However each element of the programme is run several times during the day, and some tickets are held for in-person bookings on the day. So arrive by 9:15am and you can be one of the first in line for the morning tickets when they’re released. TNA is very mobility-friendly. I had to contact TNA’s team in advance of Open House to ask about mobility-impaired access; I found their response friendly and helpful. The building itself is very well set up if you’re mobility impaired: lift placement is generally good, ramp or lift access was provided to all parts of the building which I saw, and there is also a wide range of heights of chairs in different areas of the building – if you’re dealing with a more subtle mobility impairment, this is an absolute godsend, as there’s bound to be seating somewhere to suit you. Hopefully you’ll be joining the throngs for TNA’s Open House 2018. Until then though, get out to your local archives this week and explore – make the most of what’s out there! Some of you have been wondering where I’d disappeared to over the past 18 months – an update is indeed long overdue. In short: life happened and certain projects had to be put on hold. This was in part for a really lovely reason, namely the arrival of my daughter in early 2015 (yes – the DPhil was completed and I became Dr. Sophie a mere fortnight before the little one’s arrival: how’s that for a deadline, eh?). Unfortunately though the other, less pleasant, reason, has been that I’ve spent a lot of time since then in and out of hospital, so blogging has been forced to take a back seat for a time. Consolidating my existing work in education via application for HEA Fellowship. Before I discuss that though, I’d like to say a massive thank you to the Shuttleworth Foundation for supporting me with funding, and for being willing to accommodate my situation of both medical- and baby-related delays over the past year or so. And many thanks too to Peter Murray-Rust, for nominating me for the grant in the first place. The main application of the Shuttleworth money was to cover OSTI’s natural overheads, namely: domain name and hosting costs for the website, print cartridges/paper, and like-for-like replacement of IT equipment when items have finally given up the ghost (namely the Toshiba laptop in May 2015, which is used for most of the day-to-day jobs relating to OSTI, and the iPad in March 2016, which is used when I’m at conferences or when having online meetings). That list might not sound particularly riveting but, believe me, it’s been a vital help in keeping things ticking over – there’s been no other funding to cover these expenses since my Panton Fellowship with the then-OKFN concluded in 2013. The Shuttleworth money has helped me provide a partial ergo setup (keyboard and mouse) for my office, to mitigate some long-term medical issues. These really help to avoid and/or reduce joint and muscle pain when typing or using the computer for long periods, and also make typing more manageable on the bad days. I’ve actually used these for years, but previous versions were all owned by my respective departments, so when I left, the equipment couldn’t come with me. Even if you don’t need to seek out an ergo setup for health reasons, I’d definitely recommend you take a look if you get the opportunity, as I suspect many people would find ergo equipment beneficial, especially if you have to spend a substantial portion of the working day using a computer (and that’s a lot of us!). Do consider trying a few different ergo keyboards and mice out to find what works for you though: remember that there are lots of designs out there, and you might have to work through a few before you find the best one for you. And be aware that there’s a bit of a settling in phase where you get used to using “weird” incarnations of keyboard/mouse. Believe me, you get used to it pretty quickly. 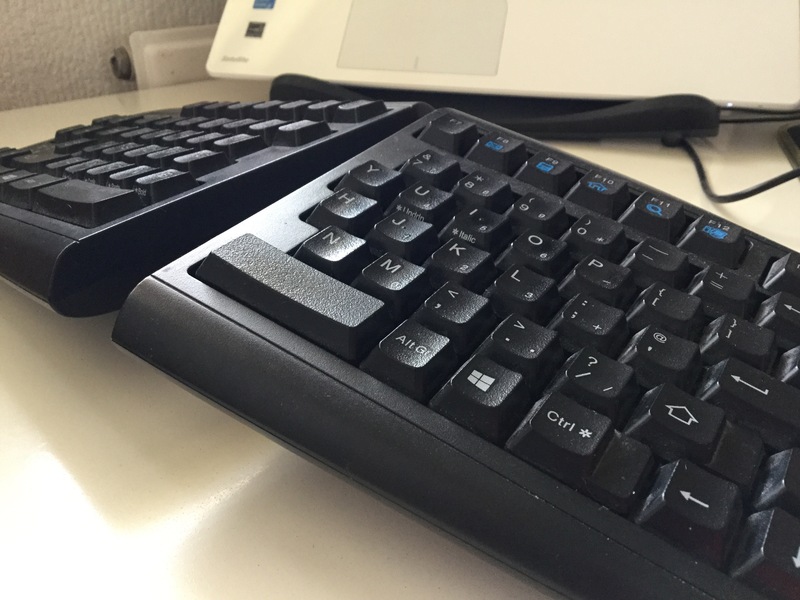 I use a Goldtouch V2 keyboard, which splits in the centre and can be angled to suit your natural hand position. On first use, this can feel a little strange, but once you’re used to it you’ll never go back to a regular flat keyboard. The other plus point (and one which I hadn’t foreseen before I got one of these) is that it forces you to improve your touch typing, by making you use the correct fingers for particular keys. 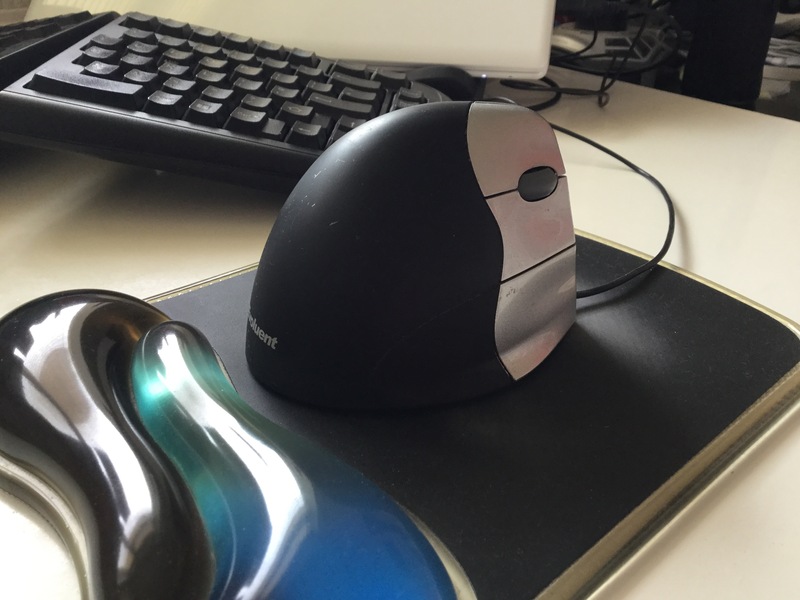 For the mouse, I use an Evoluent Vertical Mouse, which helps to reduce torque in the wrist and is really, really comfortable (they market it as “the handshake grip”). I also signed up, very optimistically, to attend both the Wikimedia UK Science Conference and MozFest, both in 2015. The plan was to take baby with me in a sling and head around things together in a bit of a mother-daughter open science mission. Unfortunately though, when each of these events hit, I wasn’t mobile enough to make it out of the house and into London (yes, the dastardly health/mobility issues again). Despite my best efforts, I wasn’t able to find people able to use my ticket instead – bad luck, as I would still have liked someone to benefit from the experience. Was such a shame to miss out but hopefully I’ll be around and about at these in the future, and thankfully the registrations were very low-cost, so didn’t put too much of a dent in the grant. I’m also working towards Fellowship accreditation with the HEA for the teaching experience I’ve gained over the past 7 years, and some of the grant is going towards this. I’ve been fortunate to have had a range of opportunities to design and deliver both undergraduate and graduate teaching and training, but I now want to consolidate this while I have the opportunity. Further work on OSTI and related projects will be strengthened by me broadening my awareness of the education literature, and enhance the credibility of the work I’m delivering. Application is going to happen around my other commitments, so it’ll most likely be a work in progress for a couple of months. I’ll let you know how I get on! I’ve not actually spent all the Shuttleworth funding yet, but have plenty of areas I’d like to put it into. Amongst these options are getting one or more people on board to help a little with updating the website design, content and navigability. In particular, I’d like to set up a dedicated area of the site for people to share their experiences – both good and bad – of using the rotation-based learning which underpins OSTI, potentially allowing them to connect with each other and even advise RBL newbies on how to go about it. An online community of RBLers, if you will. Whether you’re into Open Science, or an educator, or a community builder, I would love to hear people’s opinions on this. The eagle-eyed amongst you may have noticed the addition of the Shuttleworth Logo to the OSTI website in December 2015. Great news! Perhaps the most significant piece of news is that OSTI was awarded a Shuttleworth Flash Grant in December 2014. This is really exciting news, as the project has been run without funding since my Panton Fellowship concluded back in Spring 2013. Many thanks to Peter Murray-Rust for nominating us in the first place 🙂 Thus far, the grant has helped to manage some of our basic running costs (including, for example, domain renewal) and we have a few other ideas in the pipeline for channelling the money into various projects over the coming months. Perhaps inevitably, there are too many strands on the current to-do list to mention everything here. 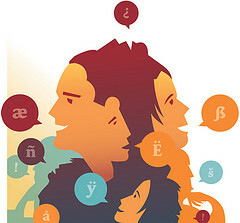 Some of the projects under construction include a redesign of our website and materials to improve the experience for dyslexic and sight-impaired users; provision of interactive spaces on our website, allowing those who’ve run OSTI- or RBL-style courses to share their experiences and offer advice; and a continued push for translation of the main teaching materials into other languages. I’ll let you know how these various projects progress! Our Learning With L ego course, which made its debut at SpotOn London in November 2013, is about to become available as a stand-alone workshop as part of Mozilla’s Lo-Fi, No-Fi teaching kit. The kit aims to deliver courses and exercises which are suitable for teaching useful skills for the web, and training in technical and scientific thinking, but which can be successfully delivered in an environment with low or no Internet connectivity. If you’ve been keeping an eye on the News section of the OSTI website, you’ll be aware this this one’s been waiting in the wings for a while. I’m glad to say that it’s now up and running – the page still has to go through some final checks before its listing is added to the Lo-Fi No-Fi page proper, but a version is already available on the Mozilla website. 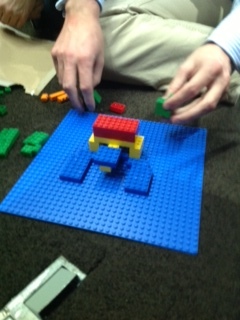 Click here for a nosy at the Mozilla-fied page of our Learning With Lego course! The downloadable instructions are the same as those used for the inaugural workshop, but were previously only available via the OSTI GitHub repository. Hopefully this neatly-packaged set of instructions will encourage more of you to give Learning With Lego a try, whether that’s with high school students, undergraduates or academic researchers. The 2014-15 academic year has also seen Learning With Lego implemented at Royal Holloway, University of London, to train their first-year mathematics undergraduates in technical writing, science communication and repeatability/reproducibility. 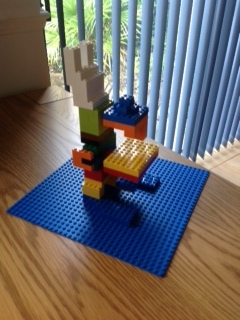 Each weekly instance of the course sees the use of full rotation based learning: not only does each group have to build the microscope model from faulty instructions and critique its description, but they must also create a Lego model of their own design, fully described with accompanying instructions. These new designs are uploaded onto a database for further use and assessment in future sessions. Encouragingly, the success of the Royal Holloway scheme has already drawn interest from their Educational Development team, who will be discussing it with the arts and humanities divisions. This may even lead to non-scientific versions of the course in the future and I’m looking forward to seeing where this leads over the coming year. This is a really important area, and one I’ve been wanting to address for quite some time (alas, running OSTI as a one-woman team makes it pretty much impossible for me to do everything at once!). The first round of OSTI teaching materials was constructed for the pilot scheme which, as none of the participants required adapted materials, didn’t account for users with specific needs. It’s high time this was remedied though, and so I’m currently developing modified versions of the OSTI materials which are suitable for sight-impaired and dyslexic users. As part of this endeavour, I’m currently in touch with the British Dyslexia Association and the RNIB to discuss how the website and educational materials in their present form need to be adapted. Both organisations also provide web pages and advice sheets to guide educators in developing suitably adapted educational materials, so I’ll also be using those to shape refinements. Hopefully we’ll see some progress here in the near future. This definitely calls for a more specific blog post sometime soon – including a bit of a call to action for those amongst you who can offer any personal insights or advice into what developments you’d like to see in the materials, where we’re falling down at the moment, and maybe even give us an appraisal of the new materials once they’re available! What does it achieve for student motivation? How easy is it to implement for a given subject? What are the tangible benefits of this approach, and are they maintained after the conclusion of the course? Of course, instances such as the OSTI pilot scheme and the recent Learning With Lego series at Royal Holloway have provided partial answers to these questions, but much more data is required. Running a one-hour workshop with the RBL teaching pattern is a completely different thing to integrating it into a two-week academic course. Not only do those two extremes involve completely different settings, but the attendee demographic will differ and the subject-specific context may interface more or less well with the RBL structure accordingly. I’d like to know more, not just about these two extrema, but about everything in between. Please get in touch (sophie[at]opensciencetraining.com) if you’ve already run an RBL-style course of any kind, or if you’re thinking of running one. I’d really appreciate any on-the-ground insights you can provide into how you found it! I’ll hold it there for today, otherwise this post is going to get far too long. But all being well, I’ll provide another progress update soon – and in any case, I’ll be providing a summary of how OSTI has put the Shuttleworth Funding to good use in due course, as per the grant’s requirements. As always though, don’t hesitate to get in touch if you’d like to discuss running an OSTI/RBL course of your own, whatever the subject area, setting or timespan! Well, it’s been quite a while since I last had a chance to blog about progress with the Open Science Training Initiative, so it’s about time I provided you with a bit of an update. Nor have things have been quiet on the open science front – admittedly I have been providing some soundbites over at the News feed of the main OSTI website – but juggling the final months of thesis writing with everything else is making things pretty busy! Currently, the bulk of OSTI teaching materials are only available in English, over at the Open Science Training GitHub repository. However, OSTI was designed for in-person teaching and for adapting local, subject-specific courses to deliver integrated open science training too. English-language versions alone cannot provide for this. Last year, some of the slides made it into Finnish as part of the Finland Open Knowledge Roadshow, care of Joona Lehtomaki and colleagues. I’d love to see a broader range of translations to take things further – some of you may already know about this from our recent discussion on the OKFN Open Science community call the other week. Realistically, I’m going to need YOUR help in translating OSTI materials into other languages. I’ve already heard from individuals from a variety of countries who would like to translate the resources we have into French, Spanish, Portuguese and Russian – I’d like to add Arabic and German to that list too. If you have language experience and an interest in open science, then I would love to hear from you – feel free to email me via the OSTI “Contact Us” details, or drop me a message in the reply box below. And if your language isn’t listed above but you’d like to be the person to add it to the list and recruit a communtiy of fellow translators, then let me know! Obviously the above will take me a little time, so keep an eye on this blog and the OSTI site for further announcements – if I know you’re interested in being one of our translators, then I can email you once plans are taking shape. So get in touch now and help to lead OSTI to pastures new! Microscope base in progress at SpotOn 2013. Photo by Sophie Kay (@StilettoFiend), licensed under a Creative Commons Attribution Licence, CC-BY 4.0. Since I ran the session at SpotOn in November 2013, the session instructions have been downloaded from the OSTI website a fantastic 193 times. Although I can’t be sure which of these were read out of interest and which involved practical use, hopefully this means the ideas surrounding the session are spreading further. 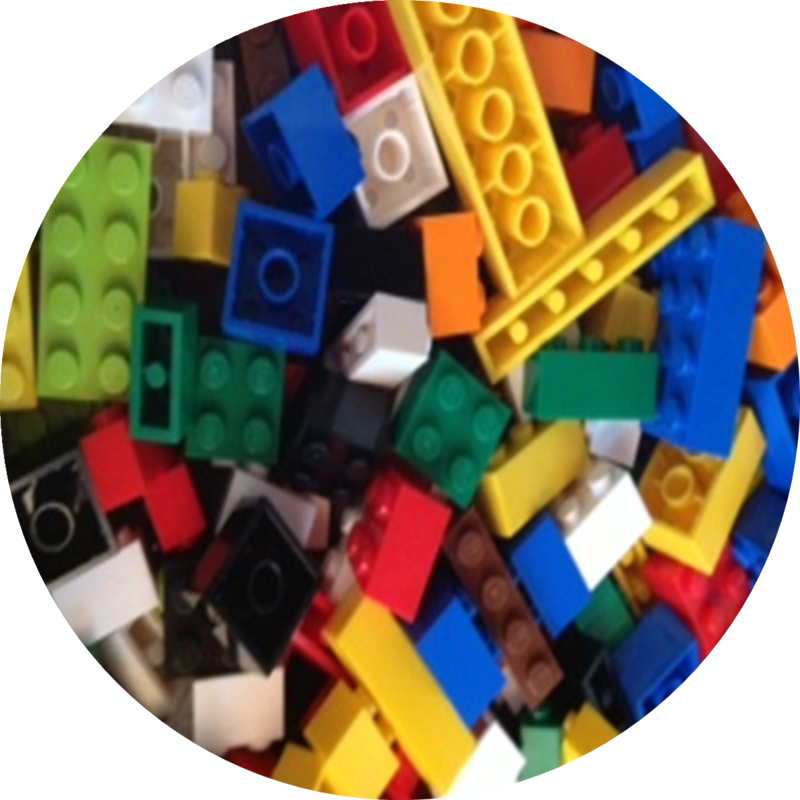 Furthermore, the mathematics department at Royal Holloway, University of London, will be adopting our Learning With Lego workshop as of this September. It’ll form a compulsory course for the first-year undergraduates and will take place on a weekly basis. It’s designed to get the students to identify what makes for good communication in a general (for which read, “Lego”) setting and, it is hoped, to pave the way for translating these experiences into improved communication of mathematical concepts during their day-to-day work. And if you’ve been keeping an eye on that OSTI News page, you’ll also be aware that the Learning With Lego workshop is soon to appear as part of Mozilla’s “Lo-Fi, No-Fi” teaching kit. Established by Kat Braybrooke and colleagues at Mozilla and drawing on input from a variety of educators, the kit provides templates and ideas for teaching the web – and associated skills for using the web – in situations where connectivity might be low or even non-existent. I’m currently revising my original, informal instructions and packaging them for the kit, so I’ll be letting you know when our Lego lesson has officially appeared. Well, I did promise a little of Berlin at the start of this post, although it’s a visit to come rather than one that’s already taken place. Thanks to the generosity of the Wikimedia Foundation, I’ll be attending OKFest next month on a Wikimedia Scholarship. While I’m in Berlin, I’ll be looking to find ways of extending and adapting OSTI, as well as starting to build a strong community of educators willing to teach OSTI programmes in their home institutions – if that sounds like your kind of thing, then please come and talk to me at OKFest! I’ll be around for all three days of the festival and will also be hosting a session – I’m co-presenting “Skills and Tools for Web Native Open Science“ with Karthik Ram on the final day of the programme, so I hope to see a mixture of new and familiar faces in the audience… And if you haven’t bought a ticket yet, then sign up here. Ah, it’s been a busy week. 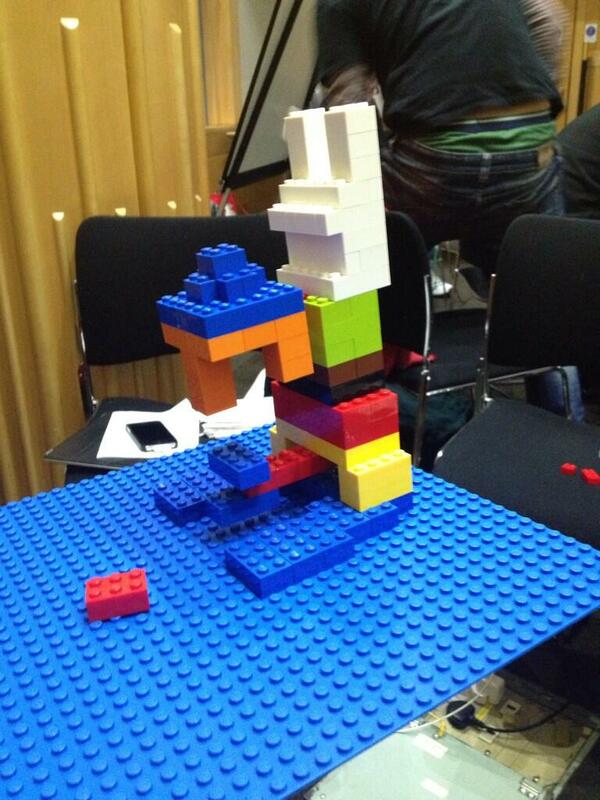 Already several days have passed since the end of SpotOn 2013, so it’s about time I blogged my session from the Saturday, #solo13lego. I’m not able to deliver the kind of prolific blogging which some of my fellow attendees at the #solo13blogs session are capable of. My workshop did admittedly have its own title, “Making Research Useful: The Consequences of (Bad) Communication“, but that didn’t prove as catchy as referring to it as “The One With Lego“, which was perhaps a better indicator of the main aspect of its appeal. Peter Murray Rust has already blogged about his experience of the session, so you can also head over there to hear an attendee’s perspective. We were also highly fortunate in that SpotOn keynote, Salvatore Mela, inadvertently kicked off the Lego vibe on Day One of the conference when he showed us pictures of a gloriously Lego-fied particle collider. Couldn’t have asked for a better theme-setting ahead of our workshop! 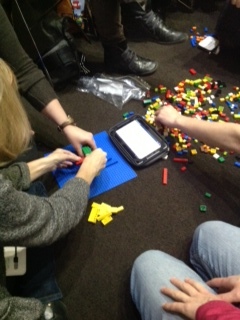 Participants deep in thought and Lego at Solo13. Photo by Neil Chue Hong (@npch). Licensed under a Creative Commons Attribution Licence, CC-BY-3.0. There’s been a lot said about reproducibility of late (indeed, the result of much work and discussion in the scientific community over many years – see discussion here), whether that’s to do with working culture, tools, infrastructure or incentives – all highly relevant factors and issues that need to be dealt with. Ultimately though, the reproducibility issue boils down to a failure on the part of the research producer to anticipate or account for the needs of the research user (that may sound an oversimplification, but it’ll do for now – I’ll go into details in a future blog post, otherwise I’ll ramble on for ages here). A microscope from one of our Group B teams. Photo by Suzi Gage (@soozaphone). #solo13lego aimed to redress the balance and get participants thinking about how to identify the needs of the end user. By dealing with the frustrations of poorly communicated instructions, could they pinpoint where the problems lay, how the original writer had failed in their communication, and how the situation might be improved? Split into groups of ten, the participants had to download a set of Lego instructions to build an optical microscope, complete with “mirror”, stage, objective lenses and eyepieces. We had three sets of instructions, each describing the same item in a slightly different way. The results of (I think) one of the Group B efforts. Here the faulty instructions for the middle section have caused problems in constructing the microscope stage. Photo by Sarah Cosgriff (@Sarah_Cosgriff). And now for the catch: these were faulty instructions, deliberately written to confuse, confound and completely obstruct the user, and devoid of diagrams, schematics, images or any other visual aid. Although the participants were aware of this from the beginning, it didn’t prevent them from becoming highly frustrated with the situation! In addition to dealing with the pecularities of the instructions, our Lego builders had to identify precisely what made these instructions bad instructions, how they had failed to address the user’s needs, and how they should be improved. And the rules: no discussion between groups, no sneaky peeks at each other’s models, no looking at other group’s instructions. So, how far did they get in 35 minutes? Given that they’d only had just over half an hour to interpret the instructions and build their microscopes, the groups made some good attempts. Notably though (and as one would expect) none of the groups managed to reproduce the original microscope model: hardly surprising, given the flaws in the instructions. Finished microscope by Group A – note how the alignment of the eyepieces differs from the other models shown above. Photo by Jonathan Pritchard, @jr_pritchard. In fact, if you take a look at the photos in this blog, what may at first glance seem to be identical models clearly have quite obvious differences. Some models completely missed out the band of dark green bricks in the middle of the microscope. Some didn’t manage to include the microscope stage. Others misplaced the focus dial or missed it out altogether; the alignment and position of the objective lenses and eyepieces varied wildly between models. And this really wasn’t the fault of our participants: they were doing their best with the instructions they had! …and lots more (full discussion can be viewed on the livestream footage). Microscope base in progress. Photo by Sophie Kay (@StilettoFiend), licensed under a Creative Commons Attribution Licence, CC-BY-3.0. 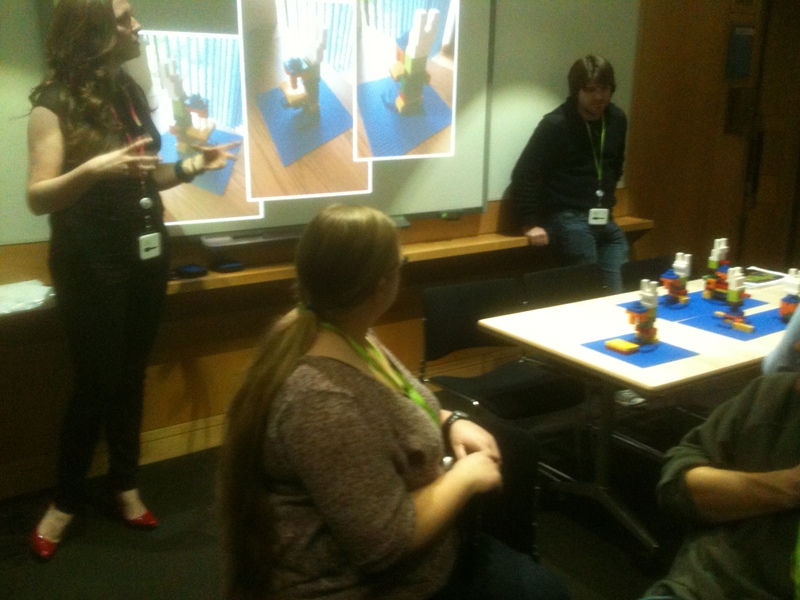 Group work in full flight at #solo13lego. Photo by Sophie Kay (@StilettoFiend), licensed under a Creative Commons Attribution Licence, CC-BY-3.0. Even this short exercise demonstrates how a supposedly simple set of instructions can produce wildly different results if ambiguities leave them open to misinterpretation. It really got us thinking about what the needs of the end user are – something which we’re not taught to think about (or indeed encouraged to do so) at any stage of our education. Could this kind of exercise, whether with Lego or with hands-on science, be used to promote better communication amongst our scientists? The extended session at the upcoming hackday (see below) is going to take this idea further and train participants to produce instructions that account for this user perspective. All five microscopes at the end of the session, alongside Sophie’s slide of how the models should have looked. Photo by Peter Murray Rust (@petermurrayrust). If you’re reading this then chances are you want to participate in the #solo13lego session, “Making Research Useful: The Consequences of (Bad) Communication“. After all, who doesn’t like Lego and science? You can follow our session remotely via the livestream, which will appear on the SpotOn Media page here. This post has been scheduled to appear a little ahead of the session, to help remote participants with their preparations (and to make sure it’s available and working by the time #solo13lego kicks off!). So if you’re planning on attending the session, behave yourself and don’t be tempted to nosy at the downloads below ahead of time! Groups who are in the session right now: You should be in groups of ten people at most. You need to assign a group leader and then form three smaller teams within your group. Your leader should help to coordinate the three sub-teams and (informally) collate feedback/critiques on the instructions as you progress with your Lego model. Talk within your team, but don’t talk to other groups – or sneak a peek at their models! A (first) little word of warning…Now, a little caveat: ONLY click on the downloads below once you’ve had your group assigned and you know your group’s letter. Remember that you’re not allowed to discuss your work with the other groups, so you shouldn’t look at their sets of instructions either! Remote participants should choose their favourite letter (without peeking at the instructions first!) and download the relevant set of instructions. 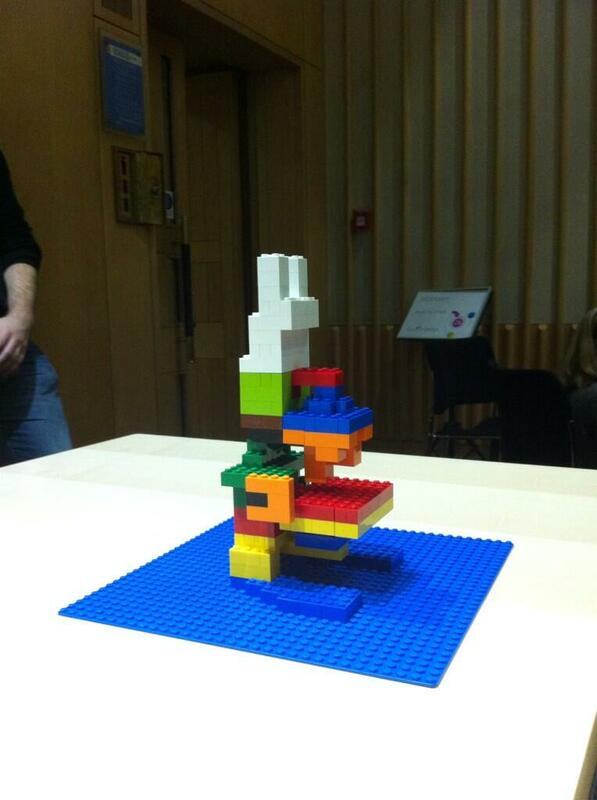 Feel free to shout any questions via the hashtag #solo13lego. You can also message me via @StilettoFiend, or alternatively David, @drg1985, if you’d prefer to hear his dulcet Irish tones. A (second) little word of warning… Remember, this session is about the consequences of poor communication. We’re encouraging you to gain the perspective of an information user rather than an information producer, so that you can bring those insights to the debate at the end of our session. So don’t be deterred by errors or ambiguities in the instructions: it’s your job to work around these, critique them and identify how these Lego recipes need to be improved (and as we said, they’re designed to have a LOT of room for improvement). With SpotOn London kicking off today, it’s time I revealed a few more details about our workshop scheduled for tomorrow afternoon, “Making Research Useful: The Consequences of (Bad) Communication“, perhaps better known by its hashtag, #solo13lego. The entire conference programme is being livestreamed, so feel free to follow, or even participate in, our session even if you can’t be there in person – keep an eye on the #solo13lego hashtag and join in the fun from afar. And if you are at SpotOn this year, then get thee to the British Library’s Eliot Room at 3:30pm on Saturday – we can accommodate up to fifty participants in the session itself (there’s only so much Lego to go around! ), so you might want to be reasonably prompt arriving. The workshop will look at some of the issues surrounding reproducibility in scientific research and in particular, the roles of the information user and information producer. And all through the wonderful medium of Lego: the perfect way to spend your Saturday afternoon 🙂 If you keep an eye on this blog, another post will be appearing at the start of the session tomorrow, explaining exactly what’s going on and providing the instructions you need for Lego building. And yes, our workshop is one of the final items in the #solo13 programme. By this stage of the conference, you’ll have enjoyed lots of fantastic talks, seminars and workshops, but may also be flagging a little with all the activity. 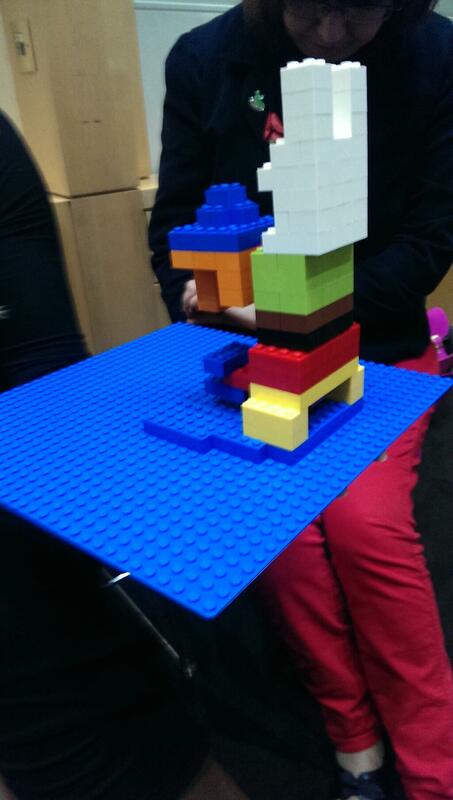 We want our #solo13lego workshop to combine thought-provoking discussion with the fun of playing with Lego. It should be a friendly session and hopefully a great way to close out your SpotOn 2013 experience – before the official Wrap Up, that is! – Do I need to bring my own Lego to the session? Don’t worry about that – we’ll be providing Lego kits for each team to use. If you can’t make it to the conference but would still like to take part in our session, then you’ll want to have a stash of Lego to hand. 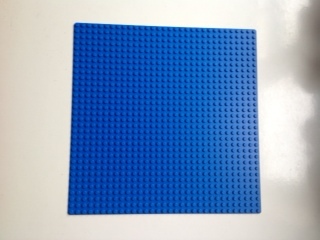 Each group in our session will be using a 32 x 32 backing board and a 650 piece Lego kit, which contains an assortment of basic bricks in several colours, including lots of those pesky 3×1, 2×1 and 1×1 pieces. So if you’re planning on remote participation, you don’t need to have any fancy Technic. Just a decent number of basic bricks will do. – What’s going to happen at the session? We’ll spend the first 5 minutes on a brief introduction to the reproducibility problem in modern science, before getting hands-on with Lego in groups, using some pre-prepared instructions designed to give you an awkward time. Each of our five groups will be given a different set of instructions to build the same item. Main rule is this: NO DISCUSSION is allowed between the groups. You can talk amongst your group all you like, but not to the other teams. It’s not expected to be plain sailing all the way: our instructions are intentionally problematic and you may have to modify them as you go or fill in the blanks if you find any omissions. At the end of the Lego building phase, our groups will be critiquing the instructions and, if they get ahead of time, providing their own new-and-improved versions. We’ll have a quick-fire discussion of what aspects were difficult, where the various Lego recipes fell down, and identify what the fundamental problems were with the way the methods were communicated. After the Lego building, we’ll take those newly-gained insights and open out the session into a debate on policy and approaches for how we train our scientists, researchers – in fact, any kind of knowledge workers – to deliver their outputs. Does modern culture focus too much on information production at the expense of information utility? If so, what can we do to change this: what incentives, penalties and support are needed? – I want to participate remotely, how can I view the session? Once you get to 3:30pm, check out the conference’s Livestream and follow our session that way. You may also want to visit Sophie’s Academia.edu profile – a slide deck will be appearing under Talks sometime on Saturday, so you should be able to access the talk materials there. 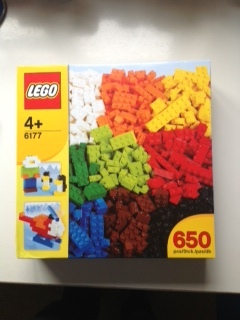 – I want to participate remotely, how will I get hold of the Lego instructions for the session? Another post will appear here at “The Stilettoed Mathematician” just before 3:30pm on Saturday 9th November. It’ll link you to downloads for the Lego instructions so you can get building with everyone else. Remember, this session is all about the consequences of bad communication, so you should expect a bit of a tussle with the instructions as you go and you’ll need to use your ingenuity. – Who’s running the session and how can I contact them? There’s a team of two running the session, myself (Sophie Kay) and David Robert Grimes, science writer for the Guardian and Irish Times. Fire any questions at us over Twitter via the #solo13lego hashtag, or shout them directly to us at @StilettoFiend and @drg1985.